Brandi Elder and John Gardner with their newly opened juice truck. 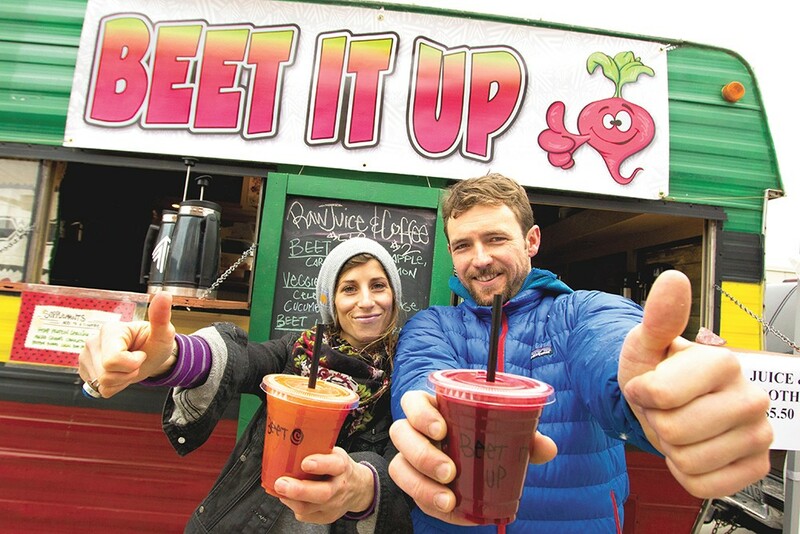 Everyone is exposed to foods that aren't good for them — things too heavy in salt, butter, caffeine, sugars and GMOs, says John Gardner, the owner of Beet It Up mobile raw juice bar. But he admits he eats bad things sometimes, too. "We'll never be perfect," says Gardner. "[Beet It Up is] a good source for you to feel better if you can — detox, clean yourself out and maintain proper nutrition." Beet It Up is the name of the mobile raw juice bar that Gardner started with Brandi Elder last month. Gardner hosts a reggae radio show on KYRS, teaches West African hand percussion and recently started a group called the Organic Beets Drum Collective, which is where he got the name for the juice bar. He loves beats and beet juice, Gardner says. Almost every juice ($5.50) on the menu has beet in it, and everything is made from certified organic produce. The Beet It Up combines apple, carrot, beet and lemon. It's a good choice for juice-drinking beginners, says Elder, as it's the most basic on the menu and has a little tang from the lemon. The Veggie Hut is a little heavier on the vegetable side, with apple, celery, cabbage, carrot, lemon, cucumber and beet, while the La-Beet-O adds only a hint of beet to a mixture of pineapple, pear, carrot and ginger. Gardner and Elder also blend up smoothies ($5.50) like the Irie Solution with banana, pineapple, berry blend, spirulina, kale and hemp milk. There's also the choice of building your own juice, getting a cup of organic fair-trade coffee or sipping some yerba maté. It's all about emphasizing health, nutrition and fitness, says Gardner. He and Elder have been into juicing for about 15 years. "This is how we live, so we want to bring it to the community on wheels," Gardner says. The two plan to be at places like farmers markets, music festivals and other events and locations around Spokane, and to eventually swap out their trailer for a food truck. Gardner says they'll do a full launch in the spring, but for now to check their Facebook page to find out when and where they're parked.